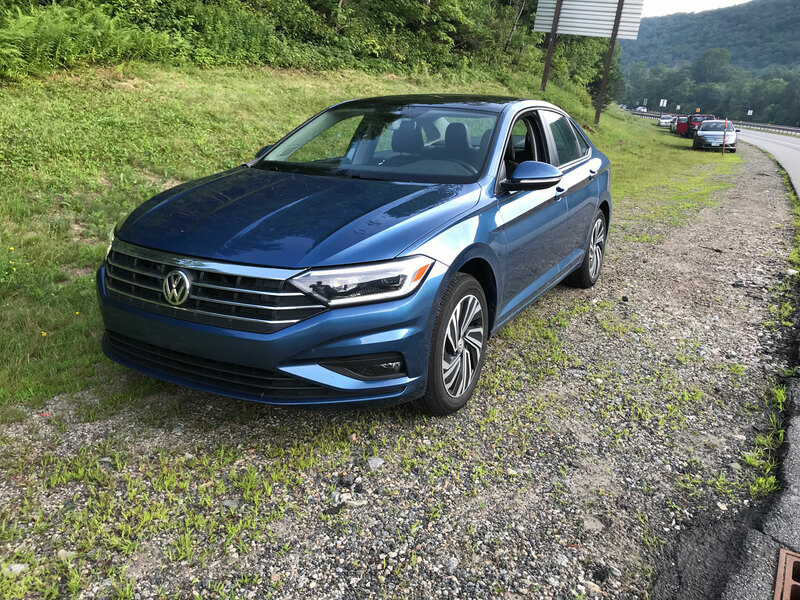 Volkswagen has released an all-new seventh-generation Jetta for 2019 and I had the pleasure of being able to spend a week with one last month. 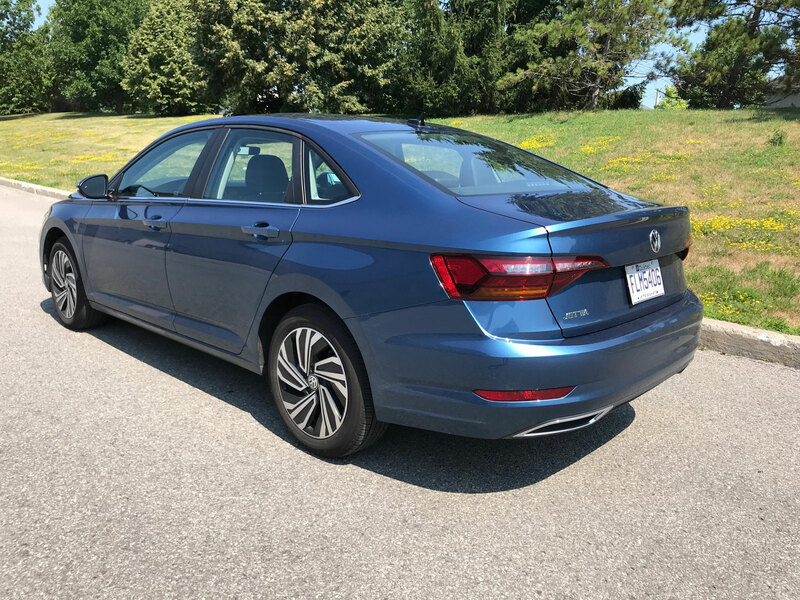 I used the opportunity to visit family in New Hampshire and the drive from Montreal and back gave me ample time behind the wheel of the new sedan. 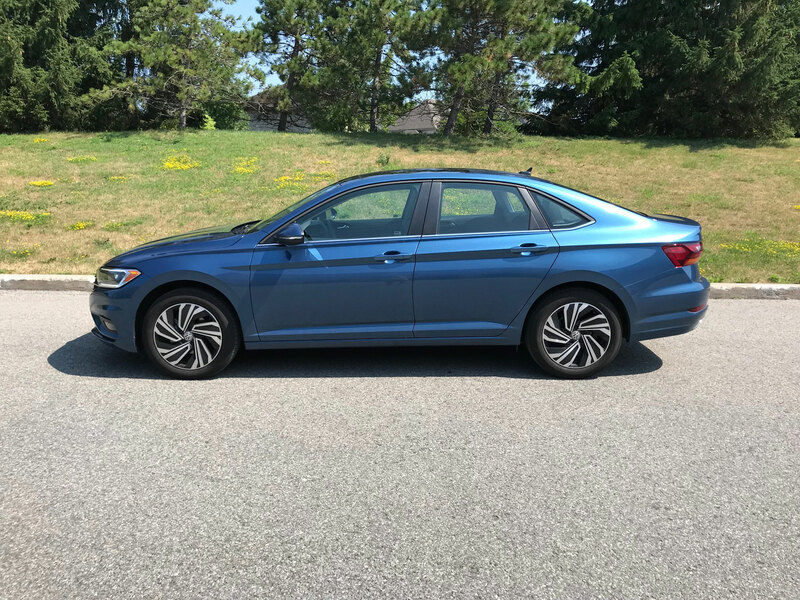 The Jetta really is all-new this year and is now using Volkswagen’s MQB architecture. What is that exactly? In plain English it’s a modular platform that allows the company to build vehicles of different sizes and configurations while saving on R&D costs. 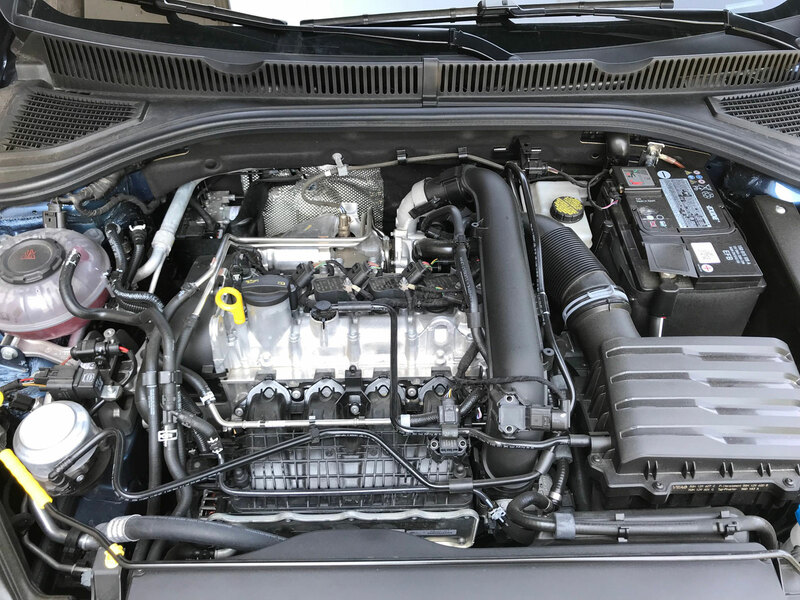 MQB is already being used on several North American models as it’s suitable for a wide range of vehicles from large crossovers to sub compacts. 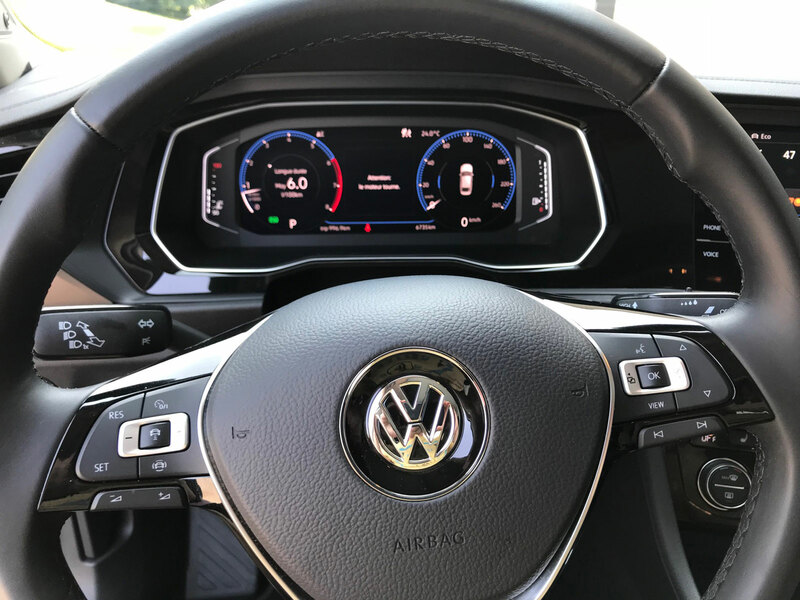 The new technology underpinning the Jetta is welcome news, in particular because the previous generation Jetta cut a few too many corners in an effort to drive the price down. 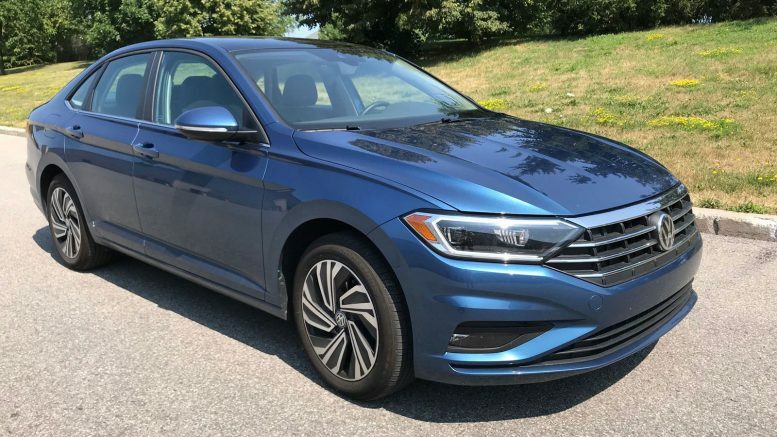 The 2019 Jetta is larger in all facets as had been the trend with each new iteration for a while. It’s about two inches longer, an inch wider and the wheelbase has also been extended about an inch and a half. 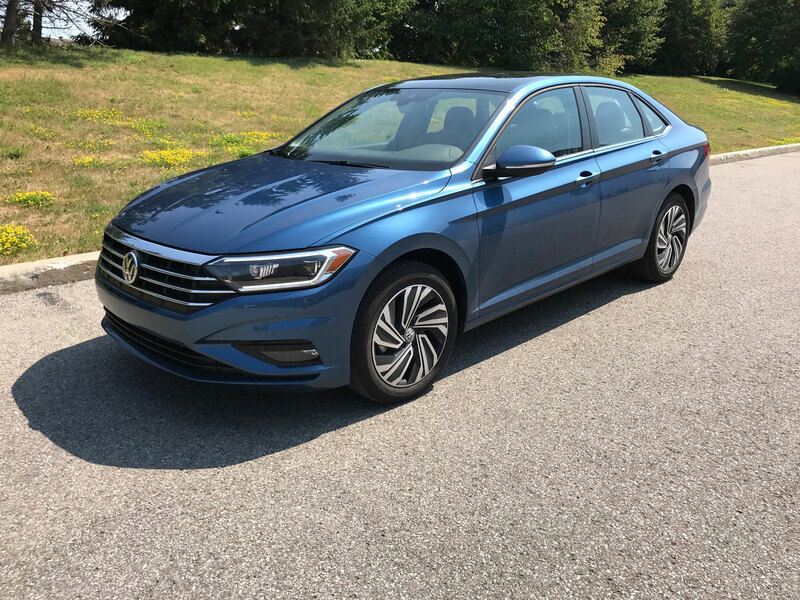 As a consequence, the Jetta is a little bit roomier inside and has more curb presence compared to the previous generation. The Jetta’s new outward appearance is very Audi-esque which will certainly attract many people. 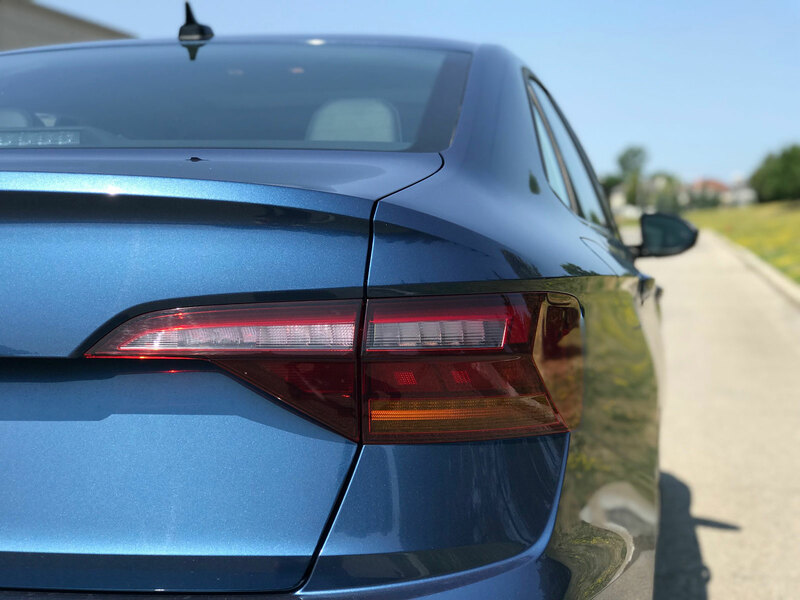 With standard LED daytime running lights, headlights and taillights, a big bold grille and a coupe-like silhouette, it has a very premium yet classy look to it. 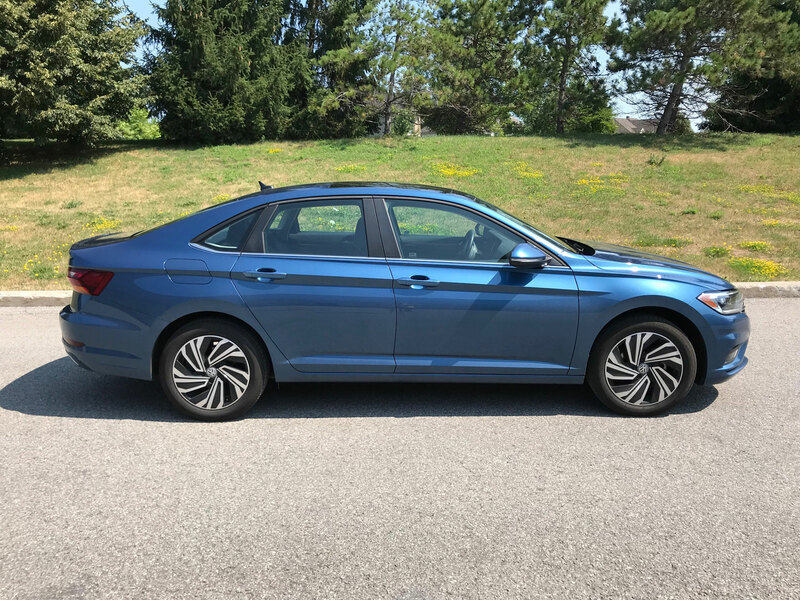 Contrast this with the spaceship-styling of the current Honda Civic and I think the Jetta makes a very good case for itself. The upgrades don’t end at the exterior either. 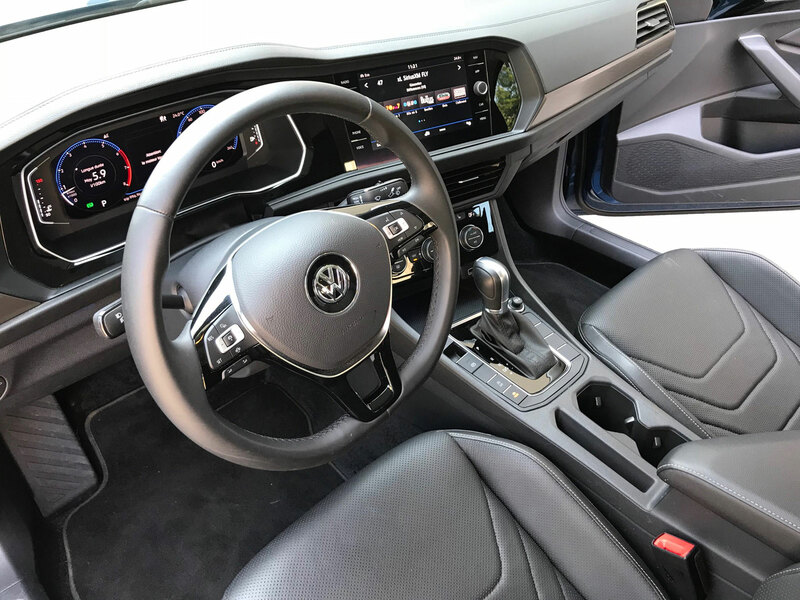 The new Jetta’s cabin is a notable improvement with a design that is angled toward the driver for excellent viewing and ease of operation. 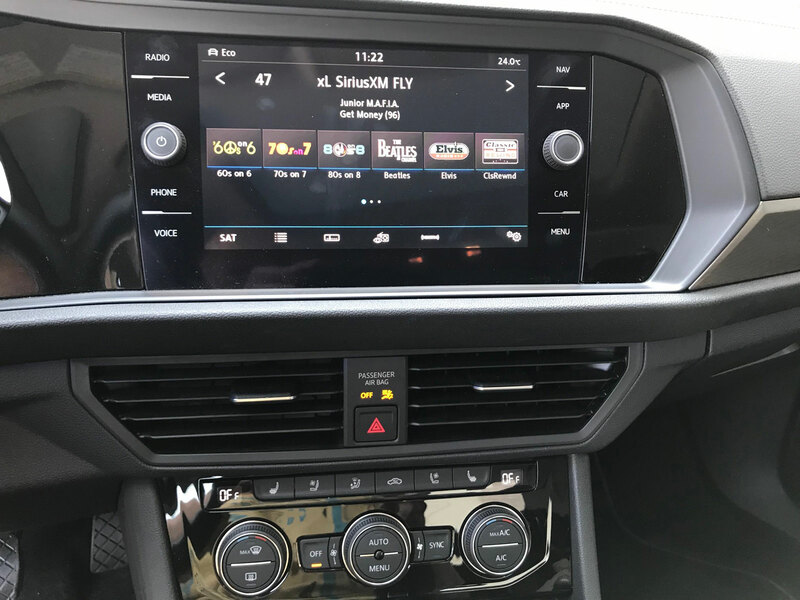 The standard touch screen is 6.5 inches but the real icing here is the optional 8.0-inch screen with the digital cockpit as an instrument panel. It’s a beautiful piece of technology that only improves that premium feel even further. The seats are firm and comfortable as is the driving position. The sporty steering wheel is among my favorites the industry, and the controls are all within reach. The one thing I would like to see changed is the HVAC control. The dials work fine but seem a bit antiquated and the miniature lights to indicate the fan level are almost invisible, especially during daylight hours. More USB ports would be welcome as well. 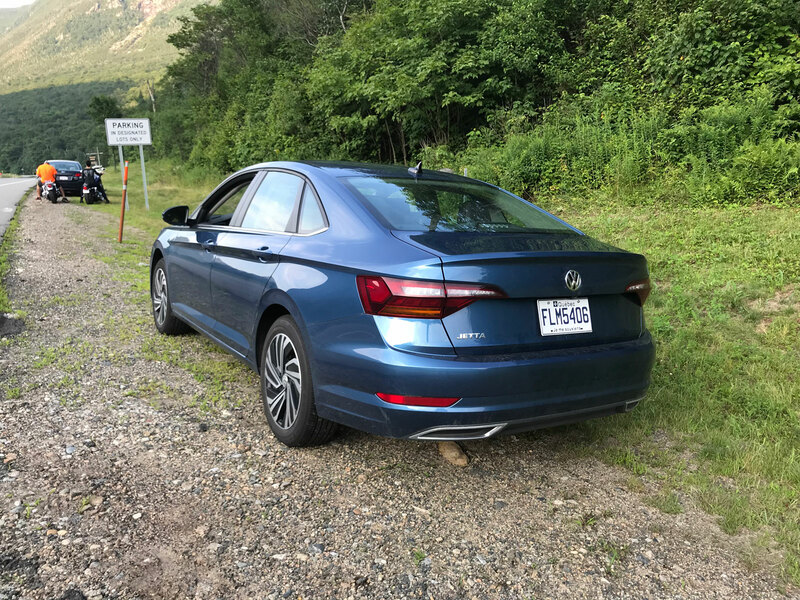 My five-hour road trip from Montreal through the New Hampshire mountains was made easy by the Jetta. It feels surprisingly peppy for the 1.4-litre four-cylinder turbo engine rated at 147 horsepower and 184 lb-ft of torque. 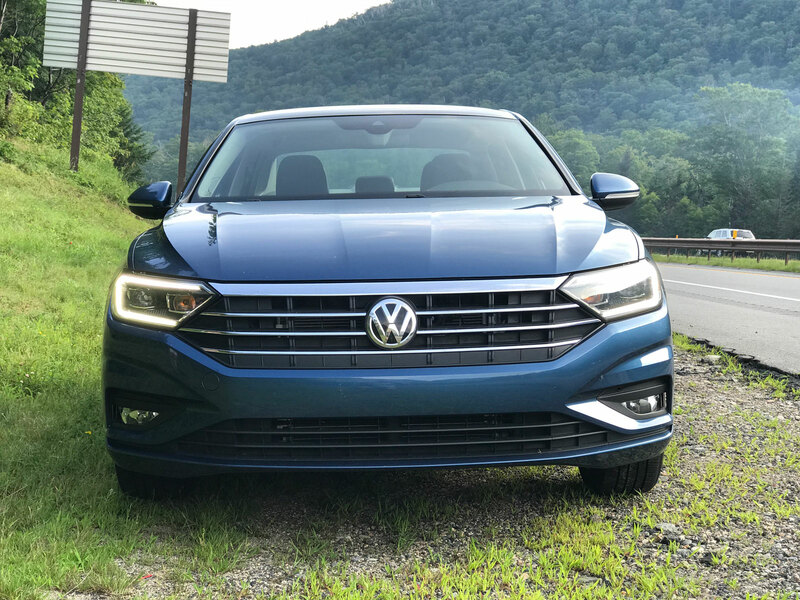 Even at night and in the rain, the Jetta felt safe and secure with good visibility thanks to the wipers and headlights. The ride its solid and confident no matter what you ask of it (provided it’s not a drag race). I was neither tired nor sore after arriving at our destination and could have gone on for longer. 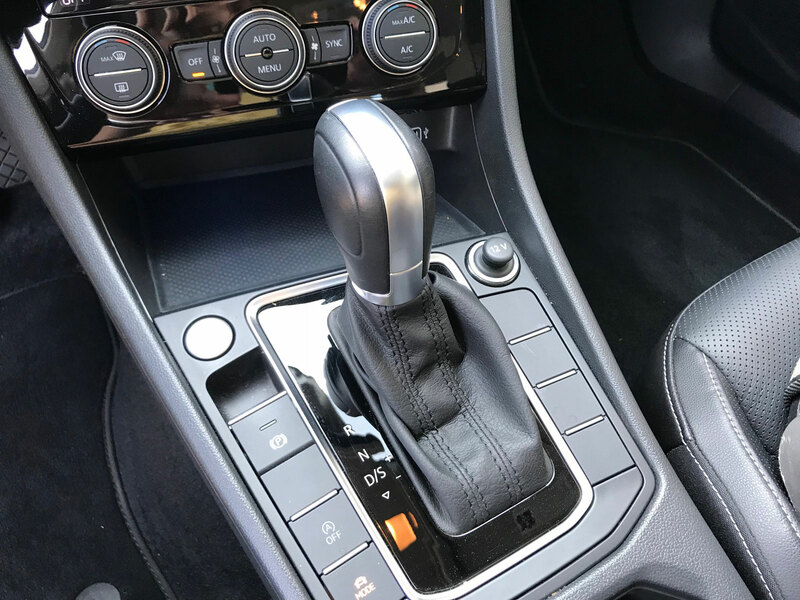 A six-speed manual gearbox is standard and an eight-speed automatic is optional. The automatic comes with the nifty engine auto stop/start feature that can save you fuel while waiting at a light. You may not think it saves much but on some of the higher end vehicles I’ve tested which can track the amount of time the vehicle is temporarily off it added up to over an hour per week. That’s 52 hours of idling per year. I averaged just 6.1 L/100km of fuel consumption for the week. Granted it was mostly highway but that’s still very good. 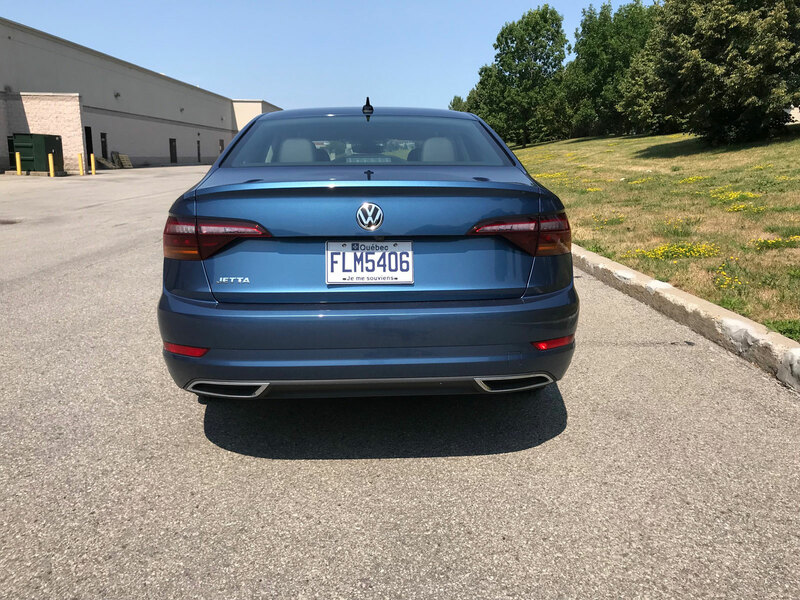 One of the few issues I had with the Jetta and I’d like to see changed is the trunk lid. It hit me in the head multiple times because unless its open all the way up and clicked into position it falls down. You’d think I’d learn the first time but opening it all the way up every time is just not a natural thing to have to do. 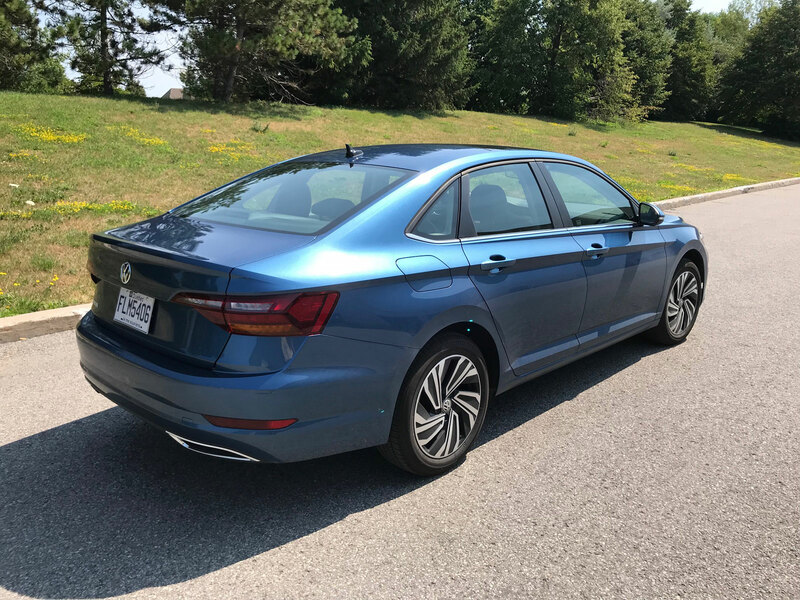 The 2019 Jetta comes in three trims at the moment including the base Comfortline, intermediate Highline and fully-loaded Execline. 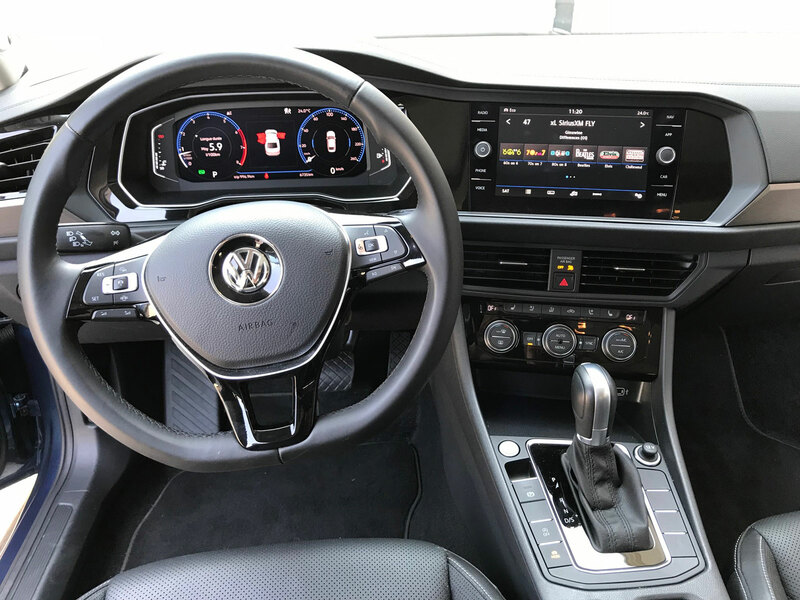 The starting price is a super-reasonable $20,995 and the Comfortline comes well equipped with the afore-mentioned LED exterior lighting but also LED mood lighting for the cabin, 16-inch wheels, Apple CarPlay, Android Auto, the 6.5-inch touch screen and automatic headlights. 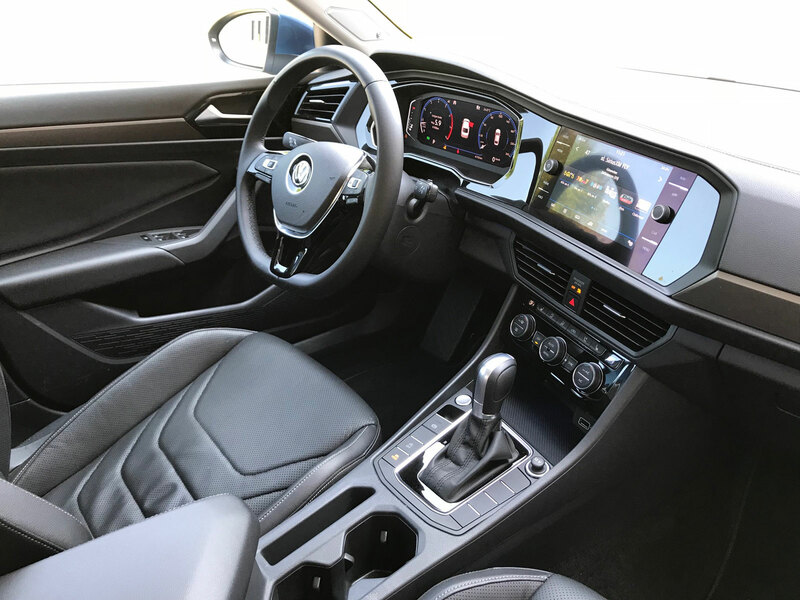 The Highline adds blind spot detection, rear cross traffic alert, dual-zone climate, keyless entry with push-button start and leatherette seats for 24,095. Finally, the Execline features the powerful BeatsAudio system, cooled front seats and the digital instrument cluster for $27,695. 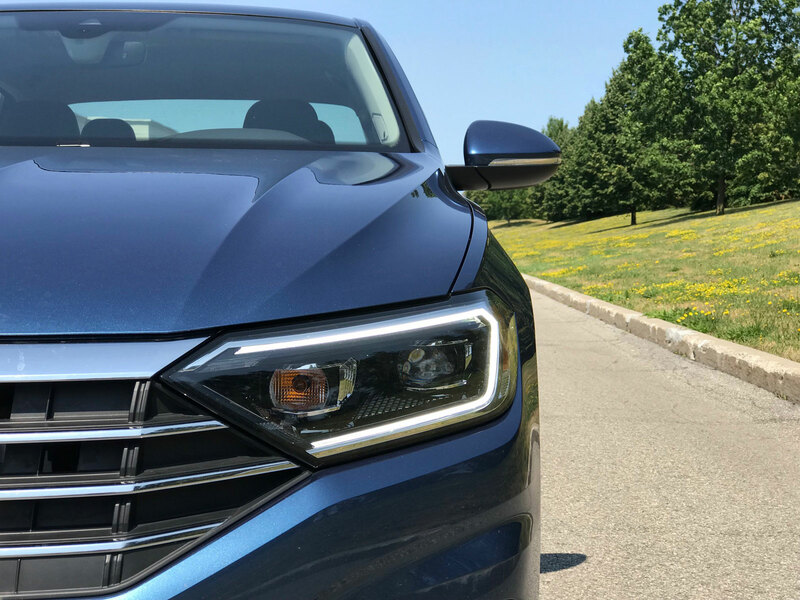 The 2019 Jetta has come to play hard. It’s an enticing package with amazing value that will certainly appeal to a wide variety of people – especially those who aren’t crazy about the crossover fad.